Brighten up your home with up to 70% off bedding, table settings, bathroom and beauty, bath and beach towels and much, much more. 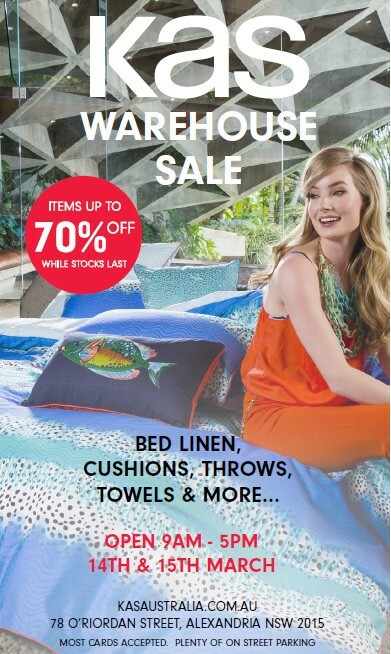 Head on down to the KAS Warehouse in Alexandria from 9am to 5pm on both days and take advantage of some stellar discounts on their signature ranges. There's also the super cute KAS Kids range! Azura King Quilt Sets, $85; matching Azura Euro Pillowcases as well as Samara Burnt Orange, Fluro Fishy & Azure cushions from $10. 500TC Egyptian Cotton Sheet Set in Teal (Queen) just $109.95. Kids' stuff, beanbags, cushion covers, & one-off samples up to 70% off! You can preview the current KAS ranges on their website. For all the latest on this sale event 'like' the Facebook profile.